A 4-in-1 production: programme, lesson, show, all put together in a site, The little music lover's lesson, the most adorable music lesson, with two elves and a hand puppet. In a world whose frighteningly fast pace often consumes all our energy and cancels any and all emotions through self-imposed daily routine, Radio Romania Music is the alternative - a space where music, tranquility and peace of mind can be found, a unique presence in the surrounding world of sounds. Radio Romania Music can become, for each and every one of you, a daily habit, up close and personal, a companion to your everyday activities and, most of all, a place where you can find your emotions, your passions, where you can feel comfortable and relaxed. Out of the need for spiritual enrichment, out of a deep desire to keep on learning or simply out of curiosity, I invite you to rejoice in the musical splendors that we try to offer you every moment of each day. Radio Romania Music was inspired by all major artistic events which have unfolded all over the world in the past decade, thus finding its purpose to be the constant support of any and all valuable musical performance. Today, in a century which can be defined through a constant swirl of changes, we wish to remain the same sturdy friend, forever close to your soul, need and aspirations. March 24th 1997: First day of broadcast on 72.08 MHz. 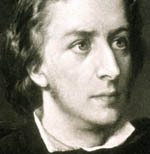 1999: The Chopin Festival is a success, thins bringing forth awards from specialized critics. The programme list becomes flexible, successfully changing its structure twice a year. 2000: Main shows: Marin Constantin – 75 anniversary concert, George Enescu – at millennium’s end, the Dinu Lipatti international festival. November 15th 2000. Through the Open Radio Project, we broadcast, via satellite feed, in Europe and Israel, 3 hours every day, 6 days a week. December 1st 2000. By broadcasting the Euroclassic Notturno programme, Radio Romania Music begins to broadcast 24 hours every day. Also from this day on, a new doorway opens to the great public: the 97,9 MHz frequency. September 1st 2003: Radio Romania Music broadcasts on a new frequency: 97,6 Mhz, which covers the Prahova, Dambovita, Brasov, Buzau, Arges, Covasna, Ilfov and partially Mures, Olt, Teleorman, Valcea, Giurgiu departments . The 72,08 Mhz, eastern wavelength, is no longer available. October 2nd 2004: The 104,8 Mhz frequency begins to broadcast, covering Bucharest. The 97,9 Mhz frequency is no longer available. 2005: 2005 –The George Enescu Year: an ambitious project which set out to shine light on the great composer and interpreter’s personality, fifty years after his death. 2006 : The Mozart Year. Three days of Mozart – 27th, 29th of January and 5th of December, with programmes which reflected the work of one of the most beloved composers in the history of music at a moment when we celebrated 250 years from his birth. January 2007: Radio Romania Music puts together a project under the patronage of the European Broadcasting Union entitled “Bucharest – a city of music”: concerts designed to reflect the music life of Romania’s capital city. February 19th 2007: Radio Romania Music broadcasts via satellite feed and can be listened to nationwide but also in Albania, Austria, Belarus, Belgium, Bosnia, Bulgaria, The Czech Republic, Cyprus, Croatia, Denmark, Switzerland, Estonia, Finland, France, Germany, Greece, Italia, Montenegro, Serbia, Latvia, Liechtenstein, Lithuania, Luxemburg, Macedonia, The Republic of Moldavia, Monaco, Norway, Holland, Poland, The Russian Federation, Slovakia, Sweden, Turkey, Ukraine, Hungary, Vatican. The programmes are broadcasted un-encoded through the Thor III satellite and can be received through the Focus Sat operator or with any digital receiver. March 20th 2008 : the beginning of the « Radio Romania Music presents Romania’s Phylarmonics » programme – live concerts from Cluj and Timişoaraamongst which, in world premiere, a piece by Gyorgy Kurtag. April 18th 2008 : The Little Music Lover’s Lesson at the Peleş National Musem– a programme taped and broadcasted by TVR Cultural. The 2008-2009 season meant a reconfiguring of the Little Music Lover’s Lesson the programme is turned into a puppet show, complete with music, being completely independent from the show that is performed every two weeks in schools and kindergartens all over Bucharest. 13th-17th of April 2009 : Handel-250 – 5 shows about the great composer, at a moment where we marked the passage of 250 years from his death. 6th-7th of May 2009 : Radio Romania Music becomes involved in the Swinging Europe programme; Romania was the first country from the former soviet block which organized this event along with the European Broadcasting Union. 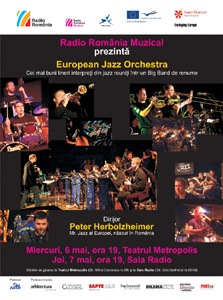 The European Jazz Orchestra concerts, conducted by Peter Herbolzheimer, at the Metropolis theater and the Radio Hall, also the meeting of the jazz producers from the EBU - all of these were great successes. June 29th –July 3rd 2009 : the unfolding of the « Paul Constantinescu – 100 » project, favored by the celebration on the 30th of June of 100 years from Paul Constantinescu’s birth ; Radio Romania is a awarded an honorary medal from the « Paul Constantinescu » Association for its efforts in the celebration of the Paul Constantinescu centennial. October 5th 2009 : the unveiling of the new Radio Romania Music website, with its English version. The first alternative online station, Opera mia, begins to broadcast. December 6th 2009 : the new website for the Little Music Lover’s Lesson is up and running; also the online alternative station For kids begins to broadcast. December 21st 2009 : the third online alternative station begins to broadcast: Relaxing music ; the English version of the Little Music Lover’s Lesson is available, including a first programme recorded in English.